Provide comfort for the family of Mary Gunter with a meaningful gesture of sympathy. 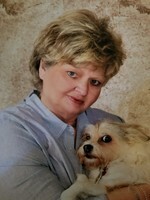 Mary Ann Gunter (nee Ferry), beloved wife of Gene Gunter. Dear sister of Terry (Debra) Ferry, Linda (the late Joseph) Ruthemeyer, Rebecca Ferry and the late Lottie (Sam) Rowe, William (Sandra) Ferry, Ruth (Dale) Mason, Charles (Liv. Lillian) Ferry, Catherine Leppert and Susan and Sally Ferry. Also survived by 26 nieces and nephews, 39 great nieces and nephews and 36 great-great nieces and nephews. Passed away November 30, 2018. Age 65 years. Visitation Wednesday December 5, 2018 from 10:00 A.M. until time of funeral service at 11:30 A.M. at the Neidhard-Minges Funeral Home, 10385 New Haven Rd., Harrison Ohio. Burial to follow at Baltimore Pike Cemetery. In lieu of flowers donations may be made to the funeral home to help defray funeral cost. We send our sincere sympathy to Mary Ann's Family and friends. We will miss her at Dunham. Sincerely, All the members of the Dunham Senior Club.